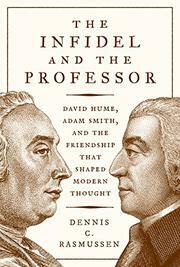 Affecting story of the friendship, intellectual and personal, of David Hume and Adam Smith, two of the greatest exponents of the Scottish Enlightenment. Both Hume and Smith were controversial in their day, writes Rasmussen (Political Science/Tufts Univ. ; The Pragmatic Enlightenment: Recovering the Liberalism of Hume, Smith, Montesquieu, and Voltaire, 2013, etc. ), and not just for the scandalous lack of religiosity for which the former was especially known. Perhaps a touch more pious, Smith earned a share of trouble for having described “the cheerfulness and equanimity of Hume’s final days,” during which, the good burghers of Edinburgh were betting, he would turn to God. It didn’t happen. Basing his account in part on the letters Hume and Smith exchanged, Rasmussen builds an intellectual biography in which the two evolve from “Dear Smith” and “Dear Hume” to “My Dearest Friend”—that last “an epithet that neither of them used with any other correspondent during the course of their friendship.” That friendship extended across two fruitful decades of Scotland’s golden age, and Rasmussen wisely does not attempt any presentist shoehorning of Hume as philosopher and Smith as economist but instead allows them the full range of pursuits across many fields. For example, though Hume today is well-known for forays into epistemology, Rasmussen writes discerningly of his “last major literary undertaking,” a multivolume history of England. (There is a small irony in Hume’s dislike of the English, for which reason we find Smith cajoling Hume to move to England with him: “Let us make short excursions together sometimes to see our friends in France and sometimes to see our friends in Scotland, but let London be the place of our ordinary residence.”) Though Rasmussen offers plenty of insights into the personalities of the two, it is their ideas that endure—and that dominate this fine book, touching on morality, mind, and, yes, market. Lively and accessible—of broad interest to readers in philosophy, economics, political science, and other disciplines.